DC fans rejoice – it’s Crossover Season over at the Arrowverse! 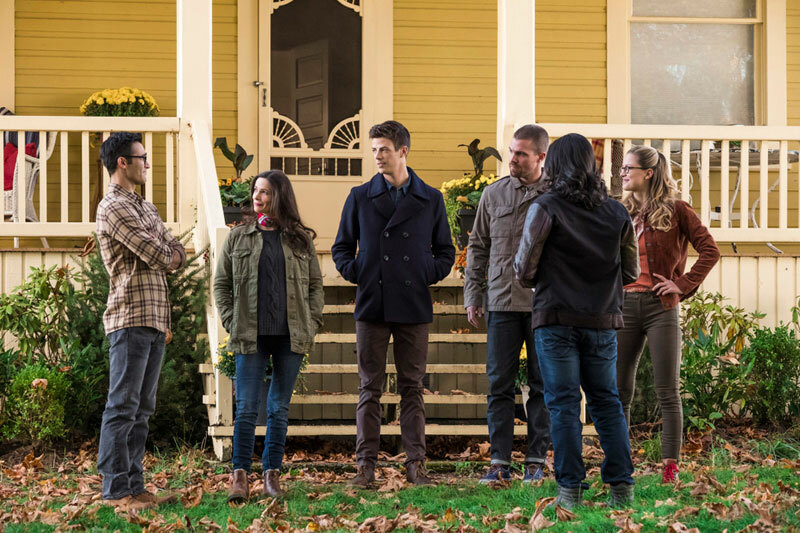 This year’s three-part crossover, aptly titled Elseworlds, began on Sunday night with The Flash and will continue through Monday and Tuesday with Arrow and Supergirl. 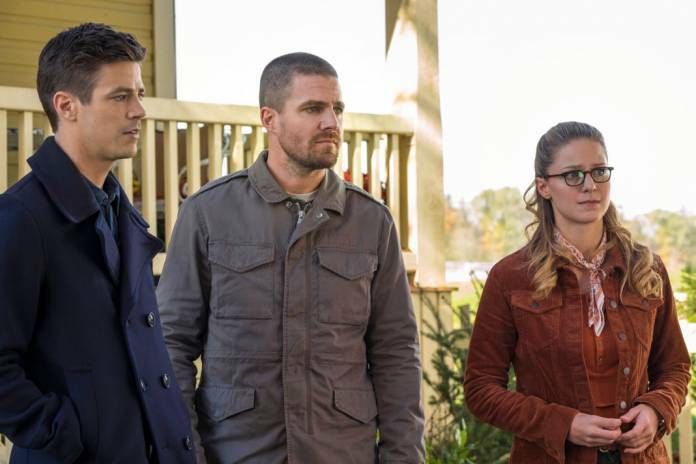 Elseworlds Part 1 is a great character study of Barry Allen (Grant Gustin) and Oliver Queen (Stephen Amell), and not surprisingly of Iris West-Allen (Candice Patton). It is full of humor and, because it is The Flash, heartfelt moments that are a staple of this show. While feeling a little light on the action side, the episode delivers plenty of gifts for diehard DC Comics fans as well as for fans of the DC superhero television series old and new. Elseworlds Part 1 begins with the end scene from last week’s episode and an explosion on Earth 90. On a battlefield strewn with bodies, the Flash (John Wesley Shipp in his original Flash suit from the 1990 television show), approaches the DC character Monitor (LaMonica Garrett), asking, “Why are you doing this?” Monitor replies, “You did this to yourselves, and now all of you will perish,” before opening his book that will destroy the world. The Flash speeds himself away before the destruction of his world. Next, we are in a lecture hall, with psychiatrist Dr. John Deegan giving a lecture on treating his patients. When he begins to speak about feelings of inferiority and eugenics, his audience ups and leaves. Deegan is approached by Monitor outside and given the reality-altering book because he has ‘great vision.’ Monitor tells Deegan that the book holds the key to his transformation; all he has to do is open it. Deegan holds the universe in his hands. Monitor advises him to use it widely and to think big. Back on Earth 1, we see Oliver Queen waking up in a strange bed with a voice calling from downstairs that breakfast is ready. That voice belongs to Iris, who calls Oliver Barry and greets him as though Oliver is the Barry that she is married to. Oliver is rightly confused, and with this newly-skewed reality, assumes that Barry must have done something wrong to the timeline. The morning is awkward and weird, so we can just imagine how Oliver must feel in this new situation. It is fun to see though, and we are treated not only to Stephen Amell’s abs, but the joy of watching the Green Arrow adapt to his new speedster powers. At the breakfast table, Iris gets notified of a robbery at Ivo Labs and tells Oliver/Barry that she will meet him at S.T.A.R. Labs. Oliver is not sure what to do, and Iris gives him Barry’s Flash ring. I never get tired of seeing how the ring works; Oliver figures it out and is in the Flash suit…er…in a flash. Oliver is unused to his Flash powers and oversteps in every way while trying to stop the robbery. Cisco tells him to use his lightning, but Oliver is not sure how. He runs circles around the robbers, and when he does manage the lightning, it is out of control, ricocheting off walls. Oliver manages to knock all the criminals out and Cisco tells him to get back to S.T.A.R. Labs and let CCPD do all the cleanup. Unbeknownst to our heroes, Oliver’s out of control lightning has unleashed a flying robot from the lab. The real Barry is over in Star City, sparring with John Diggle. Barry quickly figures out that he is Oliver Queen. He is as confused as Oliver was, but Barry is also enjoying discovering his Green Arrow abilities. Diggle is notified of some kind of arms deal going on and has Barry/Oliver suit up. It’s just as awkward for Barry to go in the field as Green Arrow, as it was for Oliver to go out as Flash, but somehow manages to get the bad guys, right before Oliver/Flash swoops in to speed Barry and Diggle away. This is where the real fun starts. There is a really fun dynamic between Barry and Oliver that reminds me of a good buddy film – there is the contrast in personality that is basically light (Barry) vs. dark (Oliver), but also a genuine friendship and a mutual respect for their powers that makes the episode so compelling. Barry is marveling at the Freaky Friday / Quantum Leap situation they are in, but Oliver sees nothing cool about it. It is not until Oliver mentions that he woke up in Iris’s bed that Barry takes the matter seriously and sees the need to fix things right now. They go back to S.T.A.R. 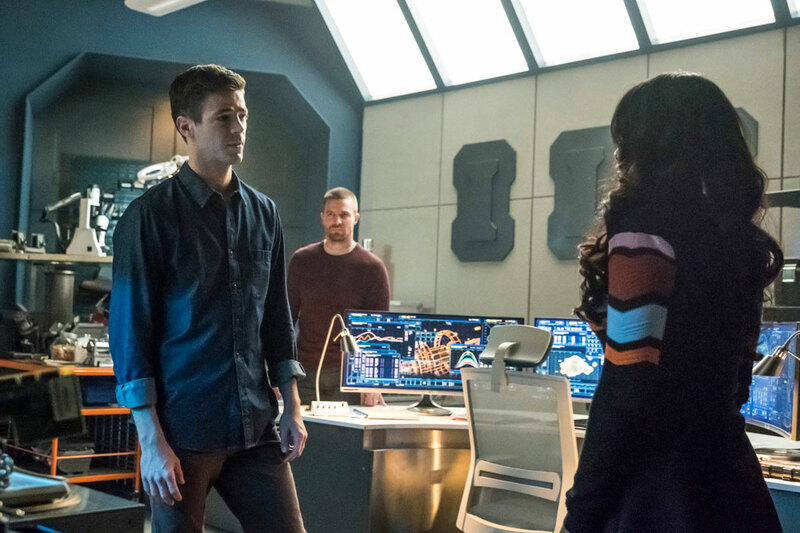 Labs and try to explain the situation to the team, but their answer is simply to lock Barry and Oliver up until they can figure out the truth. While in the pipeline, Barry and Oliver realize that while everyone on Earth seems to think that Oliver is Barry, and Barry Oliver, they should see if that is true on another Earth, devising a plan to escape and steal an extrapolator to get to Earth 38 and enlist Supergirl’s help. Iris has the extrapolator though, and Barry – the real Barry – convinces her to listen to her heart and realize that he really is the one who loved her since they first met. She is his lightning rod. 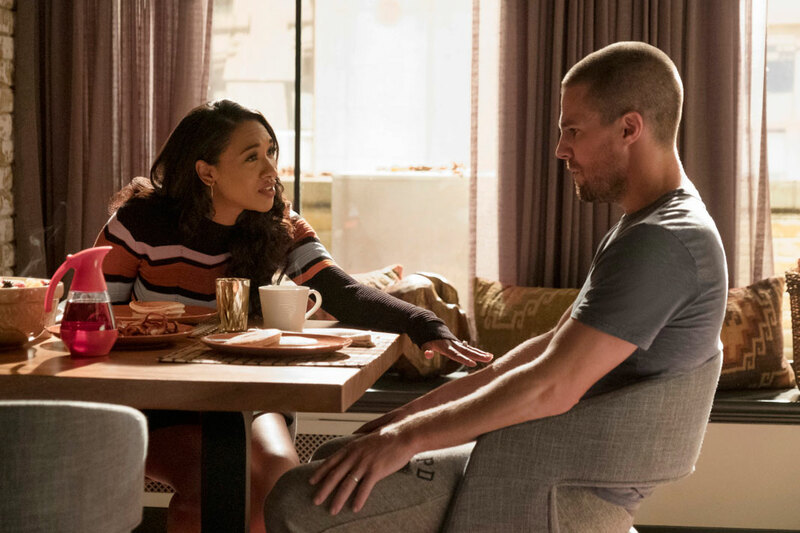 The strength of their love has been a major theme throughout the show’s history and even more so this season with the introduction of Nora, so of course Iris senses that Barry and Oliver have been telling the truth, and hands over the device. The training scenes at the farm highlight the real differences between Barry and Oliver. The scenes were funny – with Barry shooting Oliver in the back with his arrows, reminiscent of the first time they trained together when Oliver shot Barry – and serious, especially when Oliver fails at goading Barry into fighting his way. Oliver admits that in his eyes, Barry was enjoying this too much whereas he has to channel all of his anger and his pain to become the Green Arrow. Barry points out to Oliver that he has to let all of that pain go to become the Flash. They both come to the conclusion that they need to be more like each other in order to make this switch work. Kara is relieved to hear them finally come to that conclusion, saying that now they can to work together to solve how this switch came about in the first place. Enter Cisco (Carlos Valdes) – who Vibes his way to the farm to retrieve Barry and Oliver. It seems that the robot that Oliver/Flash released on Earth 1 was hunting metas and adapting to use their powers against them. He was about to destroy Central City and Earth 1 could really use the Flash and Green Arrow. Kara decides to join in the fun, and Clark also wants to come along for the ride. It was very cute when Cisco asks Clark just who he is exactly, not knowing about Superman! So this new team of supers gets back to Earth 1 to take out Amazo (DC fans will recognize this villain as the creation of Professor Ivo and a threat to the Justice League.) Oliver as the Flash, along with Superman and Supergirl, work together to pin Amazo down while Barry injects a computer virus that Cisco concocted, into the robot’s eye via an arrow. It was a surprise to hear Barry say that Amazo has failed this city just before he lets the arrow loose, and it concerned Iris. She made a point of telling him that when all is said and done, and Barry gets his own identity back, to be sure to come back as Barry and leave all the parts of him that are like Oliver behind. We shall see if any of Oliver’s traits rub off on Barry as the season progresses. Despite killing off Amazo, Barry and Oliver still need to find out how their identities got switched and how to get back to themselves. Cisco can help with that because he has been seeing glimpses of a strange vibe. Oliver and Barry tell Cisco to show them and they vibe with him to see Monitor handing off the book to Dr. Deegan. They don’t know who these individuals in the vibe are, but they do know where they are: Gotham City! 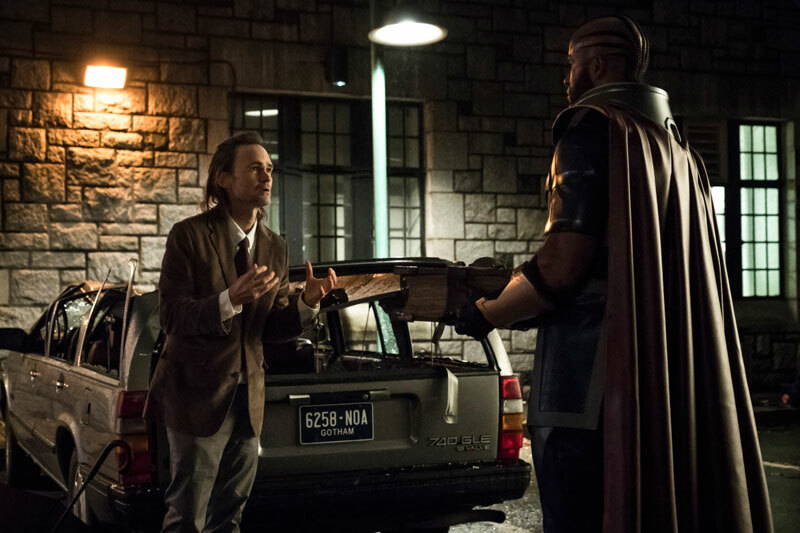 It looks like another trip is in store for the Flash/Arrow teams, and this time it’s to Gotham. It won’t be to see Batman though. The last scene of the episode shows Batwoman (Ruby Rose) gracing the skyline. I can’t wait! You can look here for more of Elseworlds Part 1 and a behind-the-scenes featurette, and check out a Batwoman clip and a featurette on Elseworlds Part 2 below! Next articleShaun the Sheep Movie: Farmageddon Teaser Trailer and Poster!